Summer solstice came and went, and we’re smack in the middle of the hottest week this year. A formal dinner party at home may not seem synonymous with a heat wave, but with the right planning, a summer soirée—regardless of the rising temps—can still be totally chic. Besides stocking your fridge with copious amounts of rosé and considering a menu that’s reliant on fresh, flavorful produce so your guests will leave feeling pleasantly satiated (not in the midst of a food coma), you can set the tone for guests to feel comfortable but transported with a stellar tablescape. We’re adults now, so if you’ve yet to invest in some beautiful dinnerware, it’s about time. And at Michael Aram’s West Hollywood Design District outpost, there are so many beautiful options to choose from. Besides the designer’s beloved classic pieces, the store offers so many colorful and festive plates, glasses, and table accessories to create a tropical, summery tablescape for your dinner party. 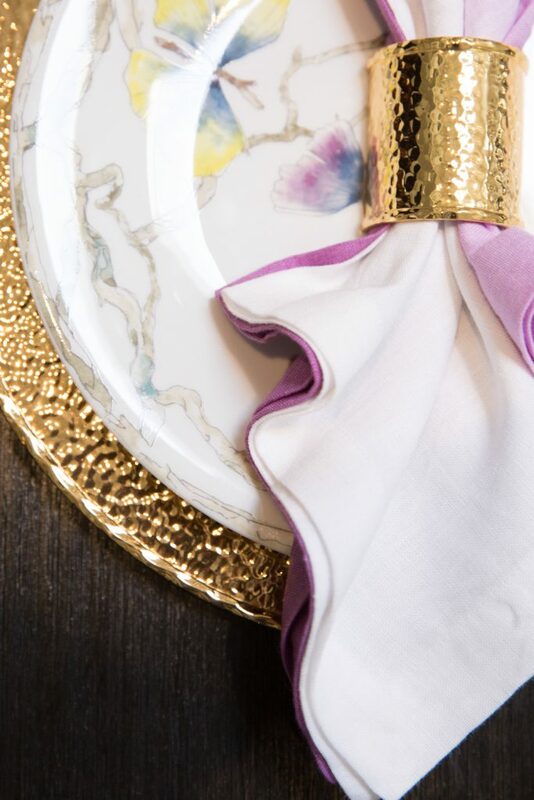 Start by injecting a bit of color; Aram’s dip dyed linen napkins are just the right amount of Bohemian, so they set the tone for our inspired table setting. But to keep the dinner feeling formal, the addition of metals took things up a notch. Hammered gold chargers and napkin rings balance some of the more playful pieces, like palm tree candleholders and plates with a butterfly and ginkgo motif. In fact flora and fauna details—like bowls and patterns with leaf-like details—are perfect for affairs al fresco. But if you don’t want to get too fussy, skip some of the more fine-dining details. Instead of setting your table with every type of glass imaginable, choose a versatile shape that works for holding water, a customized cocktail, tropical iced tea, or a variety of other beverages, like these palm frond textured iced tea glasses. You can even leave off a table linen if you’re dining on your patio table or have a plain, simple surface to work with. Add in a bit of greenery, like a few sprigs of locally snipped bougainvillea or monstera leaves to bring a little more color and life to the table. Then all that’s left to do is chat up your company, savor the food you slaved over (or ordered in, no one is judging!) and—hopefully—enjoy the beautiful summer breeze.